Antelaea azadirachta (L.) Adelb., Melia azadirachta L.
Neem (Azadirachta indica A. Juss.) is a multipurpose tree that is highly popular in India, where it provides food and insecticide, and is used for its great number of ethnomedicinal properties. Neem leaves and the oil cake resulting from oil extraction can be used for livestock feeding, but the raw cake is poorly palatable, toxic and requires processing. Neem is a medium-sized tree, reaching 15 to 30 m in height, with a large rounded crown up to 10-20 m in diameter. It is mainly evergreen but sometimes shed its leaves during the dry season (Orwa et al., 2009; Puri, 1999). Neem has a deep taproot and is a mycorrhizal-dependent species. The bark is grey, becomes fissured and flakes in old trees. A sticky foetid sap exudates from old trees in humid climates (Orwa et al., 2009; Puri, 1999). The branches are numerous and spreading. The leaves are alternate, petiolated, clustered at the end of the branches, unequally pinnate, glabrous and dark glossy green at maturity, 20-40 cm in length and bearing 10-20 leaflets (FAO, 2015). The leaflets are 5-10 cm long x 1.2-4 cm broad, sickle-shaped and slightly denticulate (FAO, 2015; Orwa et al., 2009; Puri, 1999). 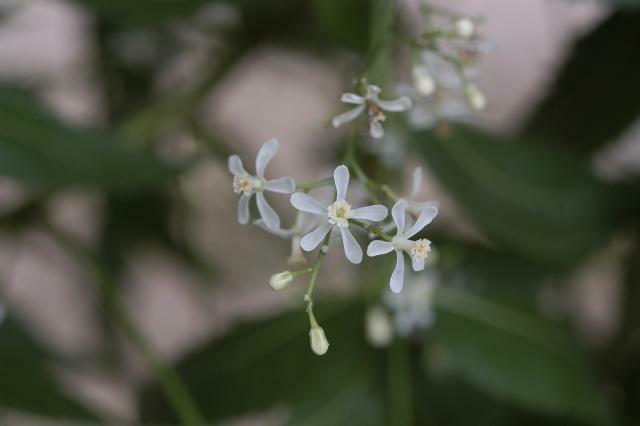 The flowers are numerous, fragrant, white and borne in large clusters (up to 30 cm long). Neem fruits are 1-2 cm long drupes, smooth and green with white milky juice when unripe, turning to yellow to brown when mature. They have a thin epicarp, a mucilagenous fleshy mesocarp and a hard endocarp. They contain a variable number of ovoid (1-2 cm) oil seeds (Orwa et al., 2009; Puri, 1999). 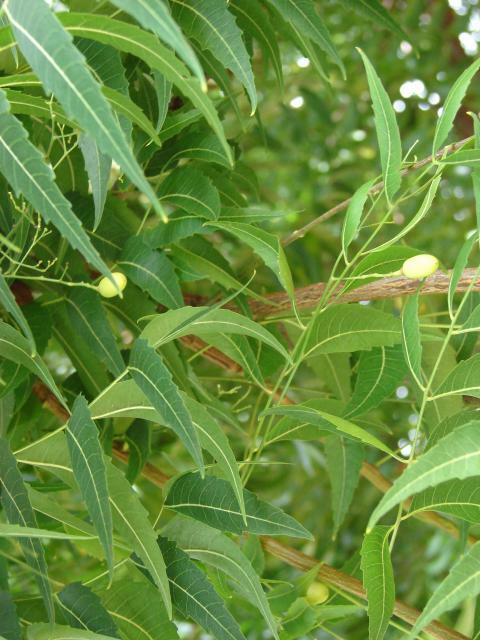 Neem is a multipurpose tree. People consume its fruits raw or cooked, and sometimes eat the young twigs and flowers as vegetables (Orwa et al., 2009). Neem leaves, bark and seed extracts have been used for centuries in India in ethnomedicine and ethnoveterinary medicine (Biswas et al., 2002; Subapriya et al., 2005). 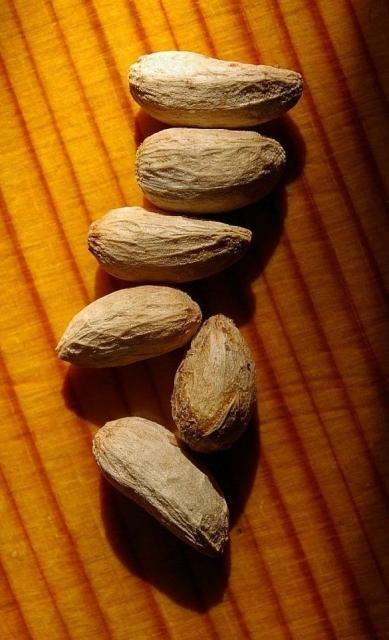 The seeds are an important source of azadirachtin, a limonoid compound (triterpenoid) present in the seeds, and also to some extent in leaves and other tissues. It acts as an insect repellent, inhibiting them from feeding, thus disrupting their growth, metamorphosis and reproduction (Orwa et al., 2009). Extracts or crude parts of the tree are often mixed with stored seeds such as maize, rice and beans, in order to protect them against insects (Boeke et al., 2004). In India, neem-based pesticides have been developed (Orwa et al., 2009). Neem extracts can protect plants from foliage-eating insects without affecting pollinating insects such as honeybees. Other neem limonoids have various properties. Melantriol and salannin act as antifeedants for insects. Nimbin and nimbindin (the latter a bitter compound present in the seed at 2%) were reported to have antiviral activity (Bostid, 1992). The oil extracted from the seeds has industrial uses and is widely used in ethnomedicine in India. However, it contains various toxic substances (including some added to increase its alleged therapeutic effect) and has been the cause of the death of children (Jindal et al., 2012; Sundaravalli et al., 1982). Neem provides valuable firewood, makes good charcoal and provides various environmental services (Orwa et al., 2009) (see Environmental impact below). The use of neem products for animal feeding remains limited. While neem leaves can be an occasional forage for ruminants and rabbits, neem seed oil cake, resulting from oil extraction of whole seeds (neem seed cake), or decorticated seeds (neem seed kernel cake), is usually considered as a non-edible oil cake only to be used as organic nitrogenous fertilizer (Ramachandran et al., 2007). Neem seed cake is a protein-rich ingredient and its use by farmers has been recorded, for instance in Southern India (Christopher, 1970). However, its unpalatability and toxicity have prevented its widespread use in livestock feeding. This product has been described as a promising potential feed ingredient since the 1970s and there have been a considerable number of attempts at rendering it suitable for livestock. While some detoxification processes do work in the laboratory, the most recent review considered that there were still many technical, economical and food safety issues to be solved before these products could be recommended for livestock (Dutta et al., 2012). 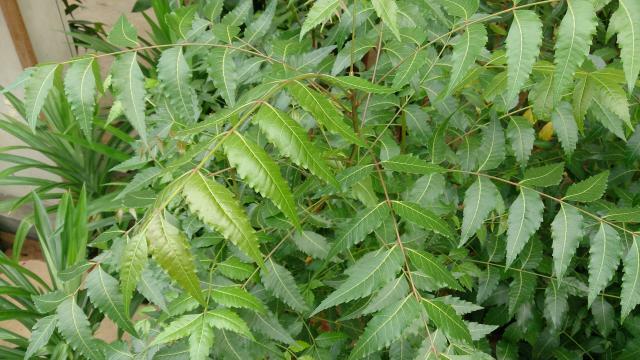 Neem is native of dry areas of the Indian subcontinent, Myanmar and China (Rojas-Sandoval et al., 2014). It was naturally distributed in Thailand, Malaysia and Indonesia and has become one of the most widespread trees in tropical and subtropical areas. It has become invasive in the Caribbean (Puerto Rico, Dominican Republic), sub-Saharan Africa (Kenya, Gambia, Senegal, Guinea Bissau, Ghana, Tanzania), and the Pacific (Australia, Fiji, Marshall Islands) (Rojas-Sandoval et al., 2014). Neem naturally occurs in dry deciduous and thorn forests, or acacia forests. In its exotic range, it has become invasive in a number of habitats including fallow agricultural land, savannah, and dry arid forests (coastal forest in Ghana, lowland monsoon forest in Indonesia, evergreen and dry deciduous forest in Africa) (Orwa et al., 2009). Neem can be found from sea level up to an altitude of 1500 m in places where average annual rainfall ranges from 400 to 1200 mm and where average annual maximum temperatures may be as high as 40°C. Adult trees tolerate some frost but seedlings are sensitive to it. Neem can grow on a wide range of soils, from acidic to alkaline pH, but it does better on shallow, stony, sandy, poor soils, in marginal sloping places or on rocky crevices (Puri, 1999). 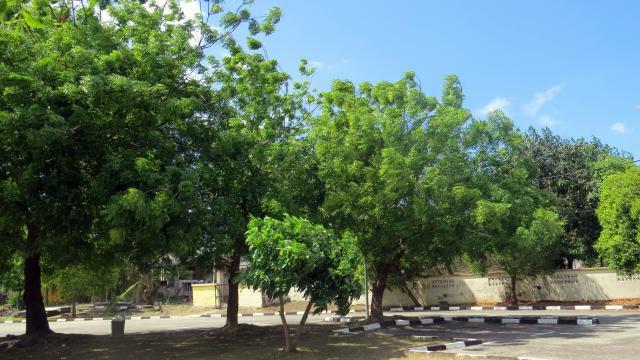 Neem is a full sunlight species but it can withstand some shade in its first years (Orwa et al., 2009). Neem is able to extract nutrients from highly leached sandy soils and can survive extreme pH conditions, from 3 to 9 (Rojas-Sandoval et al., 2014). In well-drained soils, neem withstands up to 2500 mm rainfall. Neem has some tolerance of salinity and has been used in sugarcane plantations with a significant soil salinity (Orwa et al., 2009; Ahmed et al., 1997). Because of the toxicity of neem seed cake, many processes have been investigated since the 1970s to reduce its antinutritional effects on livestock. Water washing, methanol extraction, urea and alkali treatments have all shown promising results. However, the standardisation of those techniques, their economic feasibility and the effect of such processes in meat, egg and dairy products have not yet been thoroughly investigated (Abbeddou et al., 2012; Dutta et al., 2012). A mature neem tree can produce 350 kg of leaves per year (Göhl, 1982). Neem is suitable for dune fixation and for soil reclamation in areas where salinity occurs. Neem seed cake is used as an organic manure that improves the efficiency of added N fertilizer as it delays the nitrification of soil. Neem leaves and small twigs can be used as mulch. In Burkina Faso, mulch made with neem leaves increased the yield of sorghum grain by 0.5 t/ha/year (Orwa et al., 2009; Tilander et al., 1997). Neem is a valuable shade tree that is particularly appreciated in India where it is planted on avenues, along roads and in villages (Orwa et al., 2009). It provides a good windbreak but, in the Philippines, it does not survive typhoons (Ahmed et al., 1997). In Haiti, it has been suggested to use neem for afforestation (Bostid, 1992). In India, intercropping neem with pearl millet (Pennisetum glaucum) gave good results (Orwa et al., 2009). Neem leaves have a moderate to good protein content (12-20% DM), moderate NDF and ADF contents but a high level of lignin (10-15% DM). Neem leaves contain high amounts of calcium but low amounts of phosphorus. The chemical composition of neem seed cake varies greatly depending on several factors. Neem seed cakes obtained from whole seeds have a relatively low protein content (12-20% DM) and a high fibre content (crude fibre 18-30% DM). Neem seed kernel cake, obtained from decorticated seeds, has a much higher protein content (34-41% DM) and a lower fibre content (11-17% DM). Oil content depends on the method of extraction and ranges from less than 1% to more than 10% DM. Cakes obtained from partially de-pulped and decorticated seeds are intermediate depending upon the degree of de-pulping and/or decortication of the seeds (Dutta et al., 2012). Neem products and by-products contain antinutritional and toxic factors. A comprehensive review of the literature on this aspect published up to 2003 has been written by Boeke et al., 2004. Neem leaves and seeds contain limonoids (azadirachtin, salanin, nimbin, nimbidiol, etc. ), which are triterpernoid compounds that are both bitter and toxic to many animal species. Neem leaves contain large amounts of tannins (11%) and saponins (2.5%). In ruminants, condensed tannins and saponins may be used to improve rumen ecology (Suchitra et al., 2008), but they are detrimental in monogastric species. Neem leaves have been shown to be toxic in humans and many animal species. Traditional neem leaf-based medicines taken to treat febrile illness, abdominal upset or to induce abortion or infertility had been shown to have acute toxic effects in humans (Boeke et al., 2004). Acute toxicity followed by death was reported in a sheep that ate neem leaves (Ali et al., 1982). Subacute and semi-chronic effects on male reproduction have been reported in rats (Boeke et al., 2004). Leaves fed to poultry at 2-5% of the diet resulted in many histopathological changes (Ibrahim et al., 1992a). Alcoholic extracts of neem leaves (obtained with solvents such as ethanol, methanol, etc.) have been found toxic in mice, rats and rabbits (Boeke et al., 2004). Aqueous extracts (obtained after soaking the plant into water) were reported to cause health problems in goats and guinea pigs at levels above 50 mg/kg BW. At higher doses, goats had tremors and ataxia with histopathological lesions (Ali, 1987). In chicks, the LD50 for aqueous extracts was 4800 mg/kg BW (Biu et al., 2010). Though neem oil is widely used in traditional pharmacopoeia, several cases of morbidity and mortality have been reported in humans. Ingestion of neem oil has been associated with toxic encephalopathy, Reye's syndrome and metabolic acidosis (Jindal et al., 2012; Sundaravalli et al., 1982). Many studies have observed acute and subacute toxicity of neem oil in rats, mice and rabbits. Doses of 14 and 24 mL/kg BW for rats and rabbits, respectively, resulted in acute toxicity, though one long-term study on rats fed 10% neem oil over 3 generations found the oil safe (Boeke et al., 2004). Processed oil (hydrogenated, treated with KOH, solvent extracted) might be safer (Reddy et al., 1988 cited by Puri, 1999; Rukmini, 1987). Chicks fed on neem fruits were reported to suffer from hepato-nephropathy (Ibrahim et al., 1992b). Seed extracts have been reported toxic in rats (Boeke et al., 2004). Neem leaves can be browsed or cut, dried and ground into leaf meal to be included in a concentrate diet (Puri, 1999). Fallen leaves may be used as fodder but they are less palatable. Neem leaves have been described as the forage of choice during dry periods and drought. For instance, in Gujarat, India, 15-20 kg/d of neem leaves were fed to cattle and buffalo during a famine in 1976 (Ketkar, 1976 cited by Puri, 1999). Neem leaves are said to be palatable to camels and goats. In India, DM intakes of about 3% BW were reported in goats (Amanullah et al., 2006; Bais et al., 2002). During dry periods, neem leaves were palatable to cattle (Patel et al., 1957; Hentgen, 1985 cited by Puri, 1999). Neem leaves have a relatively low nutritional value. In India, an estimated ME of 8.0 MJ/kg DM was reported (Ranjhan, 1980 cited by Puri, 1999). In Sudan, the in vitro OM digestibility of neem leaves was 51%, comparable to that of a local sorghum hay, but the estimated ME was much higher (10.0 vs. 7.8 MJ/kg DM) (Webb, 1988). In another in vitro study, the DM digestibility of neem leaves was 50% (Amanullah et al., 2006). In a trial in Thailand, neem foliage was included at 20% in the diet of growing goats as a partial substitute for soybean meal without affecting productive performance, rumen fermentation and N balance (Srisaikham, 2009). In India, sheep fed on multi-nutrient blocks that contained 30% neem leaves, as a supplement to a sorghum stover-based diet, increased intake and digestibility while blood parameters remained unchanged (Raghuvansi et al., 2007a; Raghuvansi et al., 2007b). Raw neem seed cake is unpalatable and harmful to ruminants as it adversely affects growth, the male reproductive system, and has at times led to haematuria. Consequently it should be fed to ruminants only after it has been detoxified to make it safe and palatable. Many processes have been tested including organic solvent extraction, acid or alkali treatment, water-washing, sun-drying and heating. Inclusion rates of 30-40% or more become feasible, but treatments such as water-washing or alkali treatment may also result in an important loss of nutrients, and the economic viability of such methods has not yet been established (Dutta et al., 2012). Numerous trials in India with calves, buffalo bulls, crossbred bulls and sheep have shown that raw neem seed cake is unpalatable to ruminants due to the presence of limonoids. It is possible to improve its palatability by feeding it together with ingredients such as starch, molasses, maize or sugar from palm sap. Urea-ammoniated seed cake was found to be palatable to buffalo and kids (Dutta et al., 2012). In crossbred dairy cows, water-washed neem seed kernel cake (protein 41% DM) was included at 40% in the concentrates without depressing DM intake, nutrient digestibility, milk yield, butter fat content and organoleptic evaluation of milk (Nath et al., 1989). Another experiment with 30% water-washed seed cake led to similar positive results. However, it was noted that water-washing was laborious and not feasible for industrial application, besides being uneconomical due to loss of soluble nutrients (Kumar et al., 1992). Poor palatability, as well as depressed performance and nutrient digestibility, have been observed in crossbred calves fed concentrate mixtures containing 25 or 57% raw neem seed cake, and in buffalo calves fed diets where neem seed cake provided 25 to 50% of the dietary protein (Bedi et al., 1975a; Bedi et al., 1975b cited by Dutta et al., 2012). In crossbred calves, feeding a concentrate containing neem seed cake that contributed to 12.5, 25, or 50% of the crude protein requirement, resulted in poor palatability, reduced nutrient digestibility, poor weight gain or loss of body weight (Aruwayo et al., 2013). Water-washed and sun-dried neem seed kernel cake included at 45% in a concentrate mixture to male calves did not significantly alter growth, DM intake and nutrient digestilibility (Nath et al., 1983). Water-washed neem seed kernel cake included at 40% in a concentrate mixture to buffalo calves improved growth but lowered DM and carbohydrate digestibility (Agrawal et al., 1987). In buffalo calves, NaOH-treated and urea-treated neem seed kernel meal could be included at 40% in the diet, as a complete replacement for groundnut meal, with no effect on performance and blood biochemical parameters (Sastry et al., 1999). Water-washed neem seed cake was included safely at rates of 30% in sheep diets and 20% in goat diets (Ramu et al., 1994). Likewise, water-washed neem seed kernel cake could be included in the diet of growing goats at up to 25-30% without deleterious effects on nutrient utilization, metabolism, carcass quality and organoleptic characteristics (Verma et al., 1995; Verma et al., 1996). Urea-treated neem seed kernel cake included at 33% in the concentrates for growing lambs was a satisfactory replacement of groundnut cake, though microcalculi were found in the kidneys (Musalia et al., 2000). Urea-ammonia treated neem seed kernel cake could be included at 22.5% in the concentrate for growing goats, replacing groundnut meal, with no effect on performance, and a better feed:gain ratio (Anandan et al., 1999). Information on the use of neem seed cake in pigs is scarce. Water-washed neem seed kernel cake could be included in growing pig diets at 10% of the diet (DM basis) to completely replace groundnut meal with no deleterious effects on growth and health parameters (Sastry et al., 1992). Raw neem seeds and seed cake are not suitable for poultry feeding due to their toxicity and to the presence of bitter compounds that impair feed intake (Gowda et al., 2000b; Uko et al., 2008). Some properties of these compounds make these products potentially valuable in veterinary medicine, for instance against external parasites (Al-Quraishy et al., 2010). Neem seeds or extracts can be used at low incorporation rates in replacement of antibiotics (Kone, 2010; Landy et al., 2011). Raw neem seeds and seed cake decrease feed intake and broiler performance. Several processes have been investigated in order to make neem products useful for poultry: soaking, cooking, alkali or acid treatments, and extraction with one or several solvents (Gowda et al., 2000b). Some encouraging results have been obtained at relatively low inclusion rates, such as better feed intake and acceptable performance. Neem seed kernel cake treated with alkali or urea maintained an acceptable level of performance at 13% inclusion in the diet (Nagalakshmi et al., 1996; Nagalakshmi et al., 1999). Toasting or autoclaving alleviated the negative effects of neem kernels and seed kernel meal (Uko et al., 2008). However, the effect of autoclaving was not constant: in some cases no improvement over raw neem products was observed (Uko et al., 2006). Therefore neem seeds and seed cake are not recommended in broiler feeding. These products may be used only in limited amounts (below 5%) after being efficiently detoxified. Raw neem seed kernel cake induced lower feed intake and laying performance when used at 15 or 20% in layer diets, while at 10% performance was maintained (Gowda et al., 1998b). Neem by-products should be used carefully in layers, given the possible long term effects on health. In male or female breeders, neem should be strictly avoided because of its potential effects on reproduction (Gowda et al., 2000b; Mohan et al., 1997). In growing quails, incorporation of 5 to 10% solvent-extracted neem kernel meal in the diet decreased growth slightly, while inducing mild pathological effects (Elangovan et al., 2000b). In laying quails, performance was maintained with 5-10% neem kernel meal but feed efficiency was reduced (Elangovan et al., 2000a). The risks of pathological effects suggest avoiding the use of neem products in quail diets. In Nigeria, dried neem leaves were used safely for growing rabbits up to 15% of the diet (Ogbuewu, 2008; Ogbuewu et al., 2010a). The very high lignin content could be considered as an advantage for the digestive health of rabbits. In rabbit does, the long term feeding of diets with 5 to 15% sun-dried neem leaves (112 days) significantly modified blood parameters (Ogbuewu et al., 2010b) without altering linear body growth and reproductive tract morphometry (Ogbuewu et al., 2011). The digestible energy of neem leaves for rabbits is about 8.0 MJ/kg DM, but protein digestibility is low (about 36%) (Lebas, 2013). Aqueous extracts of neem leaves have recognized hypoglycemic effects in rabbits (Khosla et al., 2000). The toxicity of neem oil has been demonstrated in rats and rabbits, with lungs and the central nervous system as the target organs of toxicity. The 24h DL50 was established in rabbits as 24 ml/kg BW (Gandhi et al., 1988). Despite this, raw neem seeds can be safely introduced in growing rabbit diets up to 20% corresponding to a daily intake of only 3 ml/kg BW of neem oil, without any alteration of growth performance. A higher proportion (30%) induced significant reductions in feed intake and daily weight gain (Fajinmi et al., 1990). However, when 20% of raw neem kernels (dehulled seeds) were included in the diet, feed intake and growth rate were significantly reduced, but in this case the daily oil intake was 9 ml/kg BW (Bawa et al., 2007). Neem seed cake was included at 5-10 or 20% of the diet; it was safely fed to growing rabbits at up to 10% in place of groundnut cake (Wasanthakumar et al., 1999a; Wasanthakumar et al., 1999b). A similar conclusion has been obtained with urea-ammonia treated neem kernel cake used to replace completely groundnut cake in the diets of angora rabbits (Gowda et al., 1998a), or growing New Zealand White rabbits (Gowda et al., 2000a). Neem seed cake is not generally used as a feed ingredient for fish. In common carp fingerlings (Cyprinus carpio), water-washed neem seed cake included at 10% of the diet decreased feed intake, although at up to 15% there was no negative effect on amylase and protease activity (Lenka et al., 2010). Many experiments have evaluated neem leaf extracts (aqueous or alcoholic) for their potential health benefits in fish. Neem leaf extracts had immunostimulatory effects at 5 g/l on Asian seabass (Lates calcarifer) infected with the bacterium Vibrio harveyi (Talpur et al., 2013), and at 10 g/l in common carp (Cyprinus carpio) invaded by the fungus Aphanomyces invadans (Harikrishnan et al., 2005). Methanol and ethanol extracted neem leaf was reported to have antimicrobial activity against the bacterial pathogen Aeromonas hydrophila in clown fish (Amphiprion sebae and Amphiprion ocellaris) (Dhayanithi et al., 2010). Trials with other fish species have been generally negative. In tilapia (Oreochromis niloticus, Tilapia zillii and Oreochromis mossambicus), neem leaf extract resulted in a typical stress response (hyperglycemia and higher cortisol) (Antache et al., 2014; Oyoo-Okoth et al., 2011). Male and female Nile tilapia showed gonad alterations at levels as low as 0.5 g/l (Jegede et al., 2008a). Histological examination of interstitial tissues of the ovaries in Nile tilapia females showed mild to severe necrosis, increasing with the concentration of neem leaf extract (Obaroh et al., 2014). Only one experiment reported Nile tilapia to have increased lysozyme activity, which is a welfare indicator (Antache et al., 2014). In African catfish (Clarias gariepinus), the typical stress response of hyperglycemia was reported after the use of sublethal doses of neem leaf extract over 12 weeks. Fish had histological lesions in gills and liver and lost weight (Ufodike et al., 2007). The deleterious effects of neem leaf extract can be used to control undesirable fish species (predators or parasites) in ponds. In tropical freshwater Prochilodus lineatus juveniles the LC50 was set at 4.8 g/l after 72h exposure but deleterious effects including stress response were reported. Damaged gill and kidney tissues were also observed at only 2.5 g/l (Winkaler et al., 2007). In common carp, the LC50 was reported to be only 0.1 g/l after 24h exposure and as low as 0.05 g/l after 96h exposure (Davoodi, 2012; Ahmad et al., 2011). Alcohol and water-extracted seed kernel and oil could be used to control fish predators (i.e. Heteropneustes fossilis and Anabas testudineus) (Nasiruddin et al., 1997). Neem leaf extract was reported to have antimicrobial activity against the bacterial pathogen Aeromonas hydrophila in prawns (Macrobrachium malcolmsonii) (Behera et al., 2004). BOSTID, 1992. Neem: A Tree for Solving Global Problems . Rep. Board Sci. Technol. Int. Dev. (BOSTID), National Research Council; Nat. Academies Press, Washington D. C.
Ogbuewu, I. P., 2008. Physiological responses of rabbits fed graded levels of neem (Azadirachta indica) leaf meal. Thesis, University of Technology, Owerri, Nigeria, 200 pp. Ranjhan, S. K., 1980. Animal nutrition and feeding practice in india. Vikas Publishing House, New Delhi, 350 p.